Cost Comparison Calculator: This calculator will examine two Corvette purchasing scenarios and give you a better idea of which one will save you more money. Payment Calculator: Before you buy that numbers matching big-block, make sure you can afford it! Use our handy Payment Calculator to determine how much your monthly payments will be on that new Corvette. Carburetor CFM Calculator: Looking for the right carburetor for that high output engine? Check out this calculator. Displacement Calculator: Not sure how big your Corvette engine is? This program will calculate your engine size in both cubic centimeters and cubic inches. Fuel Injector Flow Calculator: If you're planning on upgrading your Corvette's fuel injectors, this calculator will determine the flow of the new injectors returned in lbs/hr based on the improved fuel pressure. Horsepower Calculator: Calculate your Corvette's approximate horsepower output! Horsepower to Torque Conversion Calculator: Do you know your Corvette's peak horsepower and RPM? Calculate your Vette's approximate torque output! Engine RPM at 60 MPH With Various Gear Ratios and Tire Sizes: This chart lists engine rpm at a speed of 60 mph based upon various gear ratios and tire size combinations. Optimum Gear Ratio Calculator Rebuilding your Corvette's transmission and you're trying to decide upon the ideal transmission for your driving purposes? Check out this calculator and determine the best transmission for your Corvette. Rearend Ratio Calculator: This calulator will determine rear-end ratio, tire diameter, engine rpm, etc., depending on variables you enter. Total Gear Reduction Chart: This chart lists total gear reduction based upon common drive ratios and transmission gear ratios. Automotive Mathematical Formulas: A comprehensive listing of mathematical formulas used for automotive chassis, powertrain and performance calculations. Corvette Buyer's Evaluation Form: This form consists of a handy check list to help you remember what areas to look at when evaluating a Corvette for possible purchase. This form can be printed out, taken with you and makes a great addition to your future Corvette's documentation! 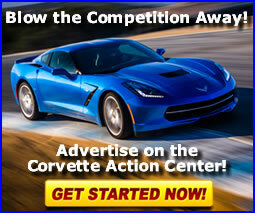 For more information please see our Buying a Corvette article. Drag Racing Correction Factors: A listing of drag racing correction factors to help convert your Quarter Mile Elapsed Time (ET) and MPH to sea level times. Fuel Consumption - Metric Measurement: This calculator determines the fuel (what ever it is) consumption of a vehicle, based on kilometers driven and liters or Imperial gallons of fuel used, and optionally, the direct fuel expense per kilometer. (You may substitute either liters or Imperial gallons consistently in this calculator. Fuel Consumption - U.S. Standard Measurement: This calculator determines the fuel consumption of a vehicle, based on miles driven and gallons of fuel used. Optionally, it will also calculate the direct fuel expense per mile, whatever the fuel is, measured in gallons. Miles Per Gallon Expense Calculator: This calculator is slightly different from the one above. It computes the miles per gallon of your car via the miles traveled and the number of gallons used. Also, if you enter the cost per gallon and how many miles you drive per day, it will estimate your monthly and yearly gas expenses. Screw Size and Conversion Tables: A listing of common automotive screw sizes and a related conversion table. Speedometer Calibration Calculator: This calculator is designed to give information related to tire size changes and the general impact they have on the calibration of a speedometer. Storage Checklist: This form consists of a handy check list to help you remember what areas of your Corvette need to be treated prior to long term/winter storage. This form can be printed out, and makes a great addition to your Corvette's documentation! For more information please see our Long Term / Winter Storage article. Tires: Bridgestone/Firestone/Dayton Tire Selector: Using this tire selector, you can identify Bridgestone, Firestone and Dayton brand tires for your Corvette. Tires: Goodyear Tire Selector: Excellent online tool for selecting Goodyear tires for your Corvette. Tires: Michelin Tire Selector: Another online tool for selecting Michelin tires for your Corvette. Tires: Tire Size Calculator: Calculate your tire diameter, rim width, section width and revolutions per mile by entering the tire cross section, aspect ration and wheel diameter values. Tires: Yokohama Tire Selector: Another online tool for selecting Yokohama tires for your Corvette. Unit Conversion Calculators: Several unit conversion calculators including, distance, weight, volume, thermal conductivity, heat transfer, and pressure & stress calculators.